The body requires a lot of good protein in order to effectively repair itself after intense workouts and therefore to do so we need supplements such as casein protein since it is difficult to get the amount of protein needed by the body from the food we eat. It is common sense to look for the best casein protein around to feed the muscles adequately. However, between the Casein protein and the whey protein, the former is the least favorite for most individuals but this is one supplement that is very important to every serious individual that wishes to build muscle mass. The Casein protein digests slowly when consumed and feeds the body with amino acids for several hours unlike the Whey Proteins that is absorbed quickly and leaving the muscles to starve and until the next serve. The Casein Protein is as effective as the whey protein but the former has the advantage of feeding the muscles for 6 to 7 hours after ingested which means that body gets a steady stream of amino acids. Slow absorption of the Casein Protein allows the body to repair and build the muscles even at night when you are sleeping. And if you are on a diet trying to lose weight while trying to gain lean muscles this will prevent you from experiencing excessive hunger when taking between meals. It is ideal to feed the body with casein protein especially after workouts and during diets. All you need is the best casein protein to take care of you and we are going to list the very best for you. How to determine the best casein protein powder is looking at the content, what nutrient it has, the taste, the level of natural and artificial sweetener, aroma and more. It can be confusing to decide on the best casein protein to use considering the fact that there are so many of them on the market. 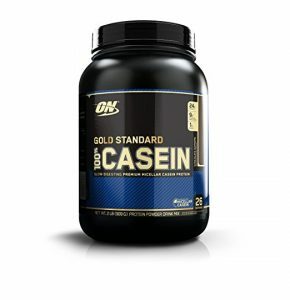 The Optimum Nutrition Gold Standard 100% Casein protein made it to number one on the list of the best Casein Protein because of a good number of reasons. First of all, this has been tested and approved by many individuals that are using it as shown on the Amazon with an approval rating of 4.2 out of 5 with almost 3,000 customer reviews at the time this buying guide was written. It is available in 10 different flavors ranging from, banana cream, chocolate peanut butter, chocolate supreme, cookie dough, natural chocolate crème, mint chocolate chip, creamy vanilla, cookies and cream, natural French vanilla, and strawberry. It is believed to be the best source of protein and calcium that support muscle rebuilding and strong bones. 24 grams per serving that absorbs slowly, best taken between meals or before going to bed. The Optimum Nutrition has been known for setting a high standard and quality products for over 30 years. It tastes consistently good when mixed and shaking adequately in a shaker cup. The Optimum Nutrition is 100% casein protein that contains amino acids that are responsible for building muscle mass. Perfect for delivering Branched Chain Amino Acids (BCAAs) that heal and make the muscles recover from any tire and sore. The Bulk Supplements Pure Casein Protein Powder is yet another recommendable Casein Protein next to Optimum Nutrition. At the time this review was written it has almost 1,000 Amazon customer reviews with an approval rating of 4.6 out of 5. This is a strong indication that it users are satisfied with the result it provides. The Bulk Supplement Pure Casein Protein Powder is a clean and pure powder that promotes muscle growth and recovery after a rigorous workout. It is a great source of casein protein that is enriched with amino acids. It does have only one flavor available which is unflavored but can always mix with any flavor of your chosen or better still just mix with water. It is also cold pressed which makes it possible to be used for cooking or baking. 26 grams of protein per serving. The list of the best casein protein won’t be complete if the Dymatize Elite 100% Micellar Casein is not listed. It currently has 301 Amazon customer reviews with an approval rating of 4.4 out of 5 at the time this review was written. This casein protein is an ideal product for those that are really looking forward to building up muscles or trying to lose weight. Just like what any good casein protein does, it supplies the body with the much-needed casein protein for 6 to 7 hours in order to heal and repair the muscles and aid recovery from a vigorous workout session. It is available in 4 different flavors which are the cinnamon bun, smooth vanilla, cookies and cream, and rich chocolate and also available in 2 sizes of 2 and 4 pounds. Its protein per serving is 25grams, BCAAs per serving is 5.4 grams, and L-Leucine per serving is 2.3 grams. It is gluten-free and no lumps will be found after mixed and shaking very well. The Naked Casein Protein has protein ratio of 26 grams per serving and is 100% micellar casein protein that is void of any artificial ingredients, no rGBH, and rBST and it comes directly from the US farms which guarantee that the protein powder is unadulterated and is filled with the essential protein, amino acids, and BCAAs. There are 3 flavors available which are Chocolate Less Naked Casein Protein, Vanilla Less Naked Casein Protein, and Unflavored Naked Casein Protein. Moreover, it is coldly processed which means that there are no synthetic additives and heavy metals or contaminations from the chemical detergents. They even post the lab tests on the product’s label to show what is in the product. It is a no surprise that after 231 Amazon customer reviews it still has an impressive approval rating of 4.2 out of 5 at the time this review was written. The majority of its users are convinced that this product delivers and that will recommend it to friends. The Muscle Tech Nitro Tech Casein Gold 100% Protein Powder is definitely a very good source of casein protein which provides more protein in a scoop with fewer carbs. 24 grams of high-quality protein per serving that is void of extra sugar and carbs plus 10 grams of BCAAs, L-Glutamine and precursors, available in 2 different flavors of chocolate supreme and vanilla bliss and 2 sizes of 2.5, and 5 pounds. It does not have any bumpy or lumpy texture after mixing very well. The Nitro-Tech Casein Gold does not only provide tasty casein protein but also high-quality protein with fewer carbs just as aforementioned. Unfortunately, there are other products that have good taste with cheap proteins which is not the case with the Nitro-Tech Casein Gold. You can easily mix 1 serving with 8 to 10 ounce of cold water or skim milk in a shaker cup or a glass but it is advised to mix 2 servings instead in 20 ounces of cold water or skim milk for best results. So far, its popularity could be seen in the Amazon customer rating of 4.5 out of 5 after 80 reviews. The Kaged Muscle Kasein is one of the rare casein products that are tested by a third party for a banned substance. This is to show how transparent the manufacturer is willing to be and to also gain the trust of prospective users. It is believed to be pure with full content disclosure on the label so that anyone that is using it will know exactly what he is taking. Each serving contains 25 grams of cold pressed micellar casein isolate that is released slowly into the body for several hours. It improves muscle recovery after a workout with the rich amino acids that help to repair and rebuild muscles. There are 2 flavors available which are chocolate shake and a vanilla shake. It has 39 Amazon customer reviews with an approval rating of 4.0 out of 5 at the time this buying guide was written. The NutraBio 100 Micellar Casein Protein has about 17 Amazon customer reviews with an approval rating of 4.3 out of 5 at the time this casein protein buying guide was written. This casein protein releases a steady stream of casein protein to the body for 4 to 6 hours which is required for muscle repair and healing and it is best taken at night in combination with Whey Protein Isolate after a workout. This will help to provide sustained amino acids supply after a workout and during sleep which are the two most important times the muscles need the constant stream of casein protein for growth and repair. It does have a high concentration of BCAAs with no additives, or fillers. There are 3 different flavors available which are wild strawberry, alpine vanilla and unflavored. The Universal Nutrition Casein Pro has 4 different flavors available, namely, chocolate peanut butter banana, vanilla soft serve, chocolate, and cookies and cream in two sizes of 2 and 4 pounds. The 4 different flavors mix well with water or milk and it is best mixed with a shaker. The Universal Nutrition Casein Pro has been in existence since 1983 and has been used by a lot of professional athletes/bodybuilders. Moreover, it has an advantage over others when it comes to the quantity of protein in a serving scoop; one serving scoop is enough while others may require 2 scoops in order to have the right quantity of protein. It is indeed great for individuals that desire good taste and at the same time wish to consume adequate and quality casein protein. It has about 25 Amazon customer reviews with an approval rating of 4.2 out of 5 at the time this buying was written. These casein protein brands listed above are certainly the best casein protein available especially the Optimum Nutrition Gold Standard. With the right and adequate of casein protein, you should be able to build that body you have always wanted to have. The casein protein is good for weight loss, weight gain and building up lean muscles.